Pannonica organizes approximately a hundred concerts a year, from September to June. It is administered and directed by a private, non-profit association actively supported by the City of Nantes and the French Ministry of Culture and Communication via the Regional Direction of Cultural Affairs. 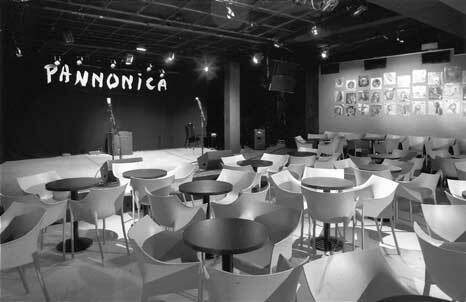 Pannonica is part of the Jazz Scenes and Improvised Music Federation, which gathers about thirty jazz clubs nationwide. The artistic project: Pannonica defines its artistic activity as “art et essai” applied to music, a concept to which we are strongly attached. In order to provide a more precise understanding of our activity, it may be helpful to expose some of our primary objectives, which make Pannonica more than a mere concert hall. We seek to :- defend an artistic and cultural project primarily devoted to modern creation in the field of Jazz and improvised music,- devote a broad space to the expression of original ideas and current creations,- set up a scheme of action designed to help the artistic growth and professional development of local artists,- allow the public to discover rare, creative music often ignored by the media.- reaffirm Pannonica’s vocation as both a relay and initiator of many different projects for festivals and other big structures- develop a coherent policy to seduce the public by keeping our prices interestingly low.- work for the consideration of jazz and new music in the debates on public policies and cultural development at national level. Please visit Pannonica’s website for more detailed information.